There are plants that work well together and plants that should be kept apart. Matching the two groups into a garden plan is often difficult, especially in a small space. Companion planting tomatoes is a lot easier than trying to lay out your entire vegetable garden with good companions. Companion planting is part experience, part folklore, and part wishful thinking. Most companion planting teachings are passed down by gardeners who experimented with pairing plants and had some success. However there are a lot of things that can impact the effectiveness of plant companions, so do not expect magic. Luckily tomatoes make good companions with the majority of popular garden vegetables. 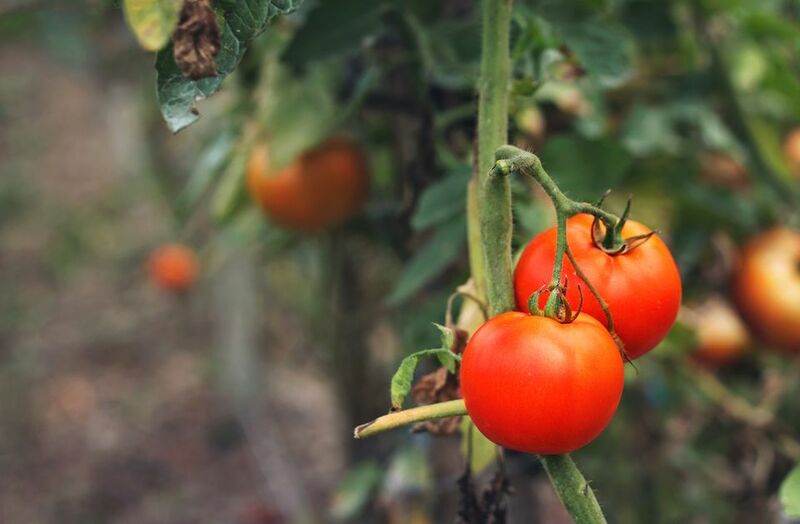 Some companion plants help improve the health and vigor of the tomato plants, some improve the tomato flavor, and other companion plants are used to repel and deter ​insect pests and diseases. You are probably going to grow some of these plants anyway, so why not experiment on your own and use some of them as companion plants for your tomatoes. A lot of plants are touted as improving the health, vigor, and flavor of tomatoes. All of these features are hard to measure, little scientific research has actually been done to back up the claims, and many other factors may be involved. Still, it is interesting to try them out in your own garden. Plants recommended for companion planting with tomatoes include amaranth, asparagus, basil, bean, borage, calendula (pot marigold), carrots, celery, chive, cleome, cosmos, cucumber, garlic, lemon balm, lettuce, marigold, mint, nasturtium, onion, parsley, peas, sage, stinging nettle, sow thistle, and squash. Basil repels insects and disease, improves growth and flavor. Repels mosquitoes and flies (even fruit flies). Borage improves growth and flavor and repels tomato worms. Bee balm, chives, dill, mint, and parsley improve health and flavor. Use dill early since mature dill starts to inhibit tomato growth. Carrots planted near tomatoes may not get as large as they should, but they will still taste good. Garlic repels red spider mites. Garlic sprays help control late blight. Stinging nettle nearby improves taste. Cabbage (Brassica) family: All relatives of cabbage stunt the growth of tomato plants (including broccoli, Brussels sprouts, cabbage, collards, cauliflower, kale, kohlrabi, rutabaga, and turnip). Corn: The corn earworm is the same as the tomato fruitworm. (Also known as the cotton bollworm.) Growing the plants in proximity that are susceptible to the same pests can invite disaster and a decimated garden. Dill: Mature dill plants, as mentioned above, will start to inhibit tomato plant growth. Plant the dill you want to go to seed away from your tomatoes. Eggplant, peppers, and potatoes: These plants are in the nightshade family like tomatoes and are all susceptible to early and late blight, which will build up in the soil and get worse each year. Avoid planting them near each other or in place of each other for at least three years. Also, planting tomatoes near potatoes can make the potatoes more susceptible to potato blight. Fennel: Fennel secretes a substance from its roots that inhibits tomato plant growth. This secretion affects many other garden plants, too. Walnuts: Do not plant tomatoes under walnut or butternut trees, which produce an allelopathic chemical called juglone that inhibits the growth of tomatoes (and all the members of the nightshade family). Tomatoes are also susceptible to the disease walnut wilt. Asparagus: Tomatoes repel the asparagus beetle. Gooseberries: The scent from interplanted tomatoes helps repel insect pests. Roses: Tomatoes can protect roses from black spot. You can interplant or use a spray. To make a spray, liquify tomato leaves and then dilute them with 4 to 5 pints of water. Add a tablespoon of cornstarch. Use the spray on rose leaves, if you cannot plant tomatoes next to them. Some believe that It could be the cornstarch that does the trick here. If you are interested in learning more about companion planting, you might want to look at two great books on the subject: "Carrots Love Tomatoes" by Louise Riotte and "Great Garden Companions" by Sally Jean Cunningham. "Carrots Love Tomatoes" helped make the idea of companion planting popular. Riotte extensively studied all types of plants from vegetables to weeds. This book could be used as a classroom text. Cunningham's book, written more casually, is jam-packed with information. The book focuses on the vegetable garden. Cunningham groups her vegetables into neighborhoods and makes pairing appropriate companions a bit easier. How Do You Control Blossom Drop in Tomato Plants?